I here about some crazy things taking place when couples get together, but I’m not much into all that strange stuff. I’ve been there, but not on the couple level – my keys stay in my pocket if you know what I mean. But, when you are hanging out with some tennis friends, having dinner and a few many (oxymoron) drinks, enjoying a nice spring evening, and the host asks, “Have you seen my wife’s taters?” one has to take notice and consider such a proposal. If nothing else, out of respect for such warmth and accommodation, one must respond to such a request. “Why, no I haven’t”, I said. “Well. Would you like to?” was the reply from the host. Oddly enough, the idea of doing so didn’t seem so unusual or out of bounds. It felt quaint, somewhat familial. Many of us had played tennis together for years and checking out the host’s wife’s taters didn’t seem so out-of-bounds as long as I was only to see her taters. Was I about to cross that line? It appeared so as the hostess grabbed my hand, opened the back door and escorted me around to the side of their home. The essence of freshly cut grass and trimmed holly bushes filled the air, along with the occasional neon-like burst from a fire fly. It was a partially moonlit eve with some dim ambient lighting coming from the home. 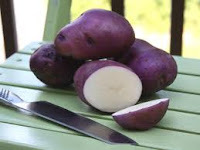 She knelt down and leaned over, reaching in as I eyed this purple, almost pinkish hue glistening from below me as she began to reveal (I felt awkward, very nervous) the topsoil to expose what were these large taters. They were huge and purple – somewhat perky as they jutted out from the earth. I was in awe and now knew why the host was so proud of his wife’s taters. As I reached in, to the garden, I discovered they were firm and so well attached, near total ripeness. One could definitely take pride in such taters. Well, I thought this an event best kept to myself and nothing need be said. These taters were now so well exposed that mere mention of them meant overstating the obvious. But, I couldn’t control myself as I began telling the other guests. Who could blame me? Those were some nice purple taters. This story and satire courtesy of me and one of the best tennis couples (much respect) I have ever met.